This is a Welsh surname. It is very unusual in that it is locational, originating from the village of Hengoed, in the county of Carmarthenshire. Very few Welsh surnames are locational, being almost entirely patronymics based largely upon biblical christian names introduced into the British Isles by returning Crusaders of the 12th century. These popular surnames include John and Johns, with the its even more popular variant, Jones, Thomas, Davies and Davis, and many others. Locational surnames are usually 'from' names. That is to say names given to people after they left their original homes to move somewhere else. The easiest way to identify such strangers was to call them byn the name of the place from whence they came. In Celtic areas either people did not move about so much, or if they did they still managed to maintain their original names. 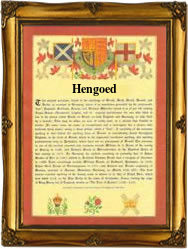 In this case we have a recording from the surrounding area of |Hengoed. Tjis was a dual christening of Catherine and Walter Hengoed, the twin children of Thomas and Anne Hengoed, at Llanelli, on December 111th 1855.